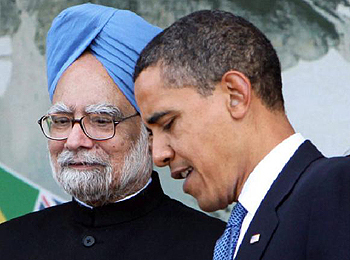 Indian Prime Minister Manmohan Singh and U.S. President Barack Obama. President Barack Obama's three-day visit to India came on the heels of an economic recession and a losing war in Afghanistan. Just before his visit, Obama felt the full lash of frustration from the American people in the midterm elections on account of a stagnant economy and increasing unemployment. Thus creation of jobs in the United States is his prime objective. American businesses desperately need markets to sell their products. They are looking towards the developing world with great optimism. India, being the second-fastest growing economy after China, is a major consumer of everything from bikes to aircrafts, nuclear power to defense equipment. In order to take advantage of the burgeoning demand from India, on the very first day of Obama's visit, 20 business deals worth a total of $10 billion were signed between the two countries. The deals included sales of Boeing passenger aircrafts, Boeing C-17 Globemasters to Indian armed forces, GE 107 F414 jet engines to the Indian Air Force, GE power turbines, and the setting up of a Harley Davidson assembly plant, among others. Obama declared that these deals will create around 54,000 jobs in the United States. All this was said and done despite the restriction on outsourcing from India. Obama also declared to lift the ban of high-tech and dual-use exports to Indian agencies—Indian Space Research Organisation, Defence Research and Development Organisation, and Bharat Dynamics Limited. Moreover, his administration has supported India's full membership in Nuclear Suppliers Group, Missile Technology Control Regime, the Australian Group and the Wassenaar Arrangement. It is being said that these concessions will help India to develop its space technology and defense industry. All this might seem to be the generosity of the Obama administration towards India, but the reality is different. Apart from eyeing economic gains by the sale of high-tech and dual-use products, the United States also wants to make geopolitical impact in Asia. Worried by the rapid rise of China, the United States wants to create a counterbalance in Asia by allying India with itself. On the last day of his visit, Obama addressed the Indian Parliament. He said many things India wanted to hear, and a few things it didn't. The most important was his vocal support for India getting a permanent seat in the reformed U.N. Security Council (UNSC). Since such a statement would not come without conditions attached, he asked India to play an active role in passing and enforcing sanctions resolutions during its two-year stint as a non-permanent member. By this, he wanted India to change its consistent stance on Iran. This was also reflected in the joint statement issued by both countries. On Iran, both leaders reaffirmed their commitment to diplomacy and discussed the need for India to meet its obligations towards the International Atomic Energy Agency and UNSC. On Pakistan, in line with Indian expectations, Obama said that terrorist safe havens within Pak borders are unacceptable and also called on Pakistan to punish the terrorists behind the Mumbai attacks. This was the most an American president could do notwithstanding the lack of strategic convergence between India and the United States on Pakistan. While for the United States Pakistan is a part of the solution, for India it is the heart of the problem. The United States badly needs Pakistan in its war against al Qaeda and the Taliban in the AfPak region. On the controversial issue of Kashmir, repeating his earlier stance, the U.S. president said Washington couldn't impose a solution and intends to work with both sides to resolve the issue bilaterally. His silence on Kashmir was ensured by the above aircraft and defense deals. Stressing the phrase "two largest democracies," Obama sought to send an indirect message to China that development can be achieved by following democratic norms and values. This was in contrast to his visit to China where he talked about "G-2" leading the world. It clearly shows that the United States seeks to contain China in Asia by supporting India. In reality, India and China cannot be compared. China has more than $2.6 trillion of investment in U.S. securities. Moreover, the annual bilateral trade between the United States and China is more than $500 billion, with balance of trade in favor of China. China has leverage with the United States that India does not. Also in his speech, Obama questioned the silence of India on human rights violations in Myanmar and maintained that being upfront on such issues did not mean interference in the affairs of another country. One could say that the same should apply to U.S. policy towards Saudi Arabia and other West Asian allies where citizens don't know the meaning of human rights—not to mention the human rights violations of Abu Ghraib and Guantanamo Bay. This visit was different in the sense that it was a give-and-take event, unlike prior visits by U.S. presidents who sought only to extract from India as much as they could. Obama gave many concessions and assurances to India. Still, there are many issues on which both countries do not share a common view. India, being a sovereign nation, has always followed an independent foreign policy. Our defined principles determine our relations with neighboring countries and the world. As Prime Minister Manmohan Singh rightly said, "We cannot choose our neighbors." We need to learn to live in peace with them without bowing to any external pressure. Indian policymakers should keep in mind that, in the 21st century, America may need India more than India needs America. Sameer Jafri is an India-based political analyst.